Perceived as the Wholesaler, Manufacturer, Supplier and Trader of gorgeous selection of Designer suit, Laxmi Prints were instituted in the year of 2005. 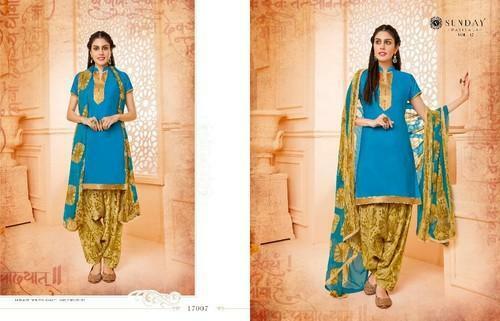 The products series granted by us consists of Party Wear Suit, Georgette Suit and Party Wear Cotton Suit. Offered clothing line is produced from highest class fabric in complete agreement with the laid commands placed by the relevant industry. Our presented products continue broadly acknowledged and demanded due to their colorfastness, excellent quality, fine embroidery works, shrink resistant and perfect stitching features. With their supply in varied exquisite designs and sizes, we have attained wide acclamation in the market. We have envisioned a highly advanced infrastructure facility at our propositions which is tied with the entire hi-tech instrument to provide excellent apparels to our esteemed clients. We have highly qualified professionals, who have rich knowledge of the industry and only use top quality fabrics and threads that are acquired from reliable suppliers of market. Moreover, they also check these clothes at industry standards to keep the quality of clothes. We deals in various brands like kimora, mohani, glossy, kalakriti, fiona and viyona etc..